The Etihad check in for Business Class is normally highly efficient, but there’s a new booking system, so I am slowed down a little in both Sydney on departure and Milan on the way home. Plenty of smiles and reassurances though and I am sorted out and on my way quickly in both places. In Milan I can’t get my boarding pass for the last leg from Abu Dhabi to Sydney (it’s due the new booking system and my flight being a Virgin Australia one). I am advised I’ll be able to get my boarding pass at the transit desk in Abu Dhabi. An express pass card gets me through security and Immigration quickly in Sydney. It’s not offered in Milan, but the security screening is efficient, and Immigration is almost non-existent, so I don’t feel deprived. Transiting in Abu Dhabi is another matter entirely. At the Transit Desk I get into the clearly marked Business/First Class queue. There’s no one in the queue ahead of me and two or three people behind. The Economy queue is quite long and at 6.00am in the morning there are only three customer services officers on duty. I wait, and I wait. Economy passengers are served and sent on their way and still I wait. After 10minutes I ask if someone will attend to us and I’m assured that yes, someone will assist me very shortly. After 25minutes, yes, someone does assist me. I’m not happy, and am even less happy when I am told I needed to go into a separate, unseen queue at the opposite end of the desk for the Virgin Australia codeshare flights. I have to insist on jumping the queue. When I am escorted to the head of the VA queue, there is a tiny Virgin Australia sign on the desk. Five minutes later I have my boarding pass. It’s appalling service, that reflects badly on both airlines (and which when I’m invited to complete a survey post flight, I take great delight in describing in detail). In Abu Dhabi, the often crowded Etihad Business Class lounge is pleasantly quiet both times I visit. I have a treatment in the Six Senses Spa on both visits. These 15minute mini-treatments never fail to please – even after the fiasco at the Transit Desk on the way home, 15minutes of their tender ministrations and I’m a new woman! The usual good variety of real meals (appropriate to the time of day), barrista coffee and plenty of fresh fruit is also on offer. There’s definitely no downside to the Lounge this trip. The lounge in Milan is a commercial lounge shared by a number of airlines. It’s been completely upgraded since the last time I flew Etihad from Milan. Spacious, comfortable and well equipped, it comes with the most amazingly spacious toilet/change rooms, making it easy to change clothes. Staff are courteous and the food and drink is plentiful in both quality and variety. I settle in and watch the departing planes in the gathering dusk – very pleasant. Business Class has new decor since I last travelled it. Gone is the pale blue – to be replaced by smart beige and black. Seating is arranged so everyone has direct access to the aisle. I love my little window seat cocoon where I can almost imagine I’m the only person on the plane, but appreciate that some might find it a bit claustrophobic. A good quality “comforter” (satin with a plush lining) has replaced the previous blanket. It’s a great addition, and stops my clothes from getting blanket fluff all over them. The entertainment system offers plenty of new release options. There’s also a special range of old and new James Bond films to celebrate the series’ 50th birthday. I have noticed an improvement in the Etihad service this trip. I’ve always found it good, but this time it was better and consistently so. Smiling and attentive, it seemed to be a bit more personal. I like the change, and Etihad gets a big tick from me for this. Food options are plentiful and of good quality. 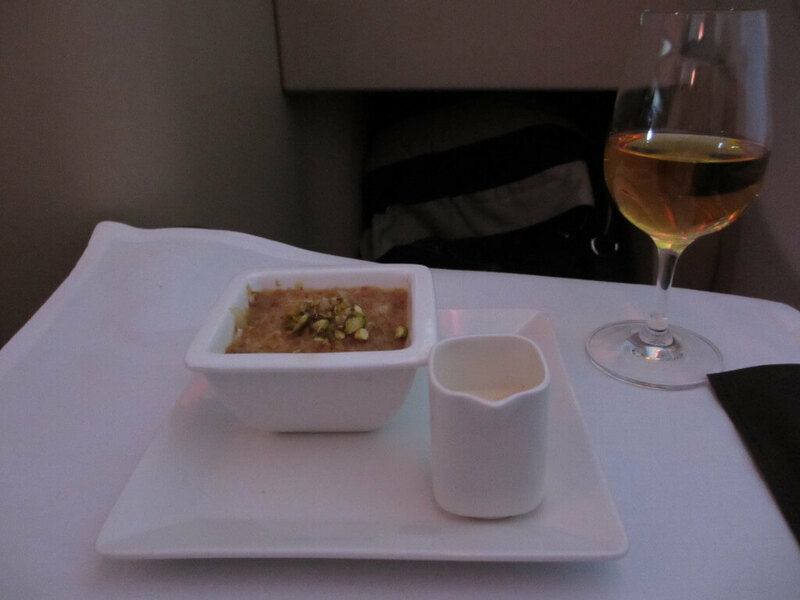 I particularly enjoyed my middle eastern style lamb shank on the Sydney to Abu Dhabi leg. This was followed by the most amazing dessert – almost like a middle eastern bread and butter pudding, but made with filo pastry and pistachio nuts. Served with a warm rose water scented creme anglaise I’m in heaven. 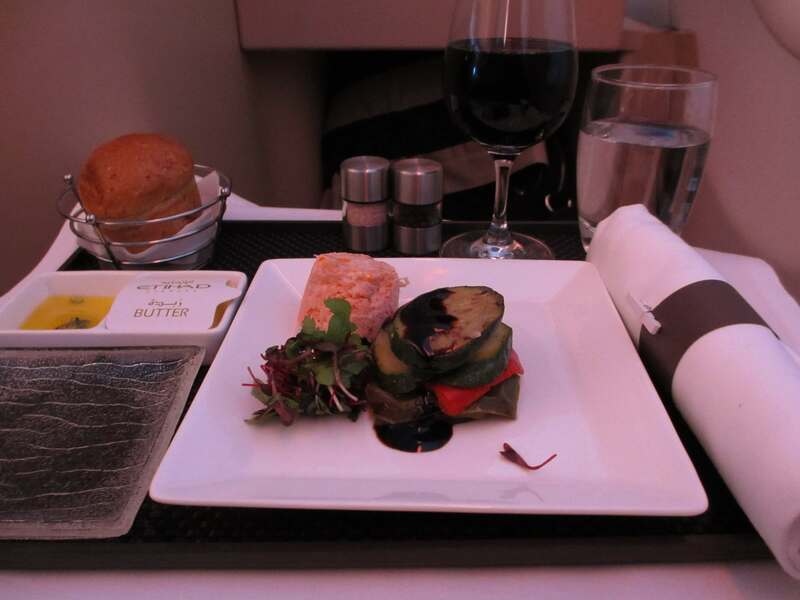 On the late night flight from Milan to Abu Dhabi on the way home there’s the choice of a full dinner or lighter express option for those who want to sleep. I go for the latter and am rewarded with a delicious yellow pepper soup. The only downside to the food is at breakfast time on the run into London when I am served an inedibly stale chocolate croissant. It was what I had previously ordered, but really, I should have been offered an alternative – it really should not have been served. That stunning dessert. I could have asked for a second! 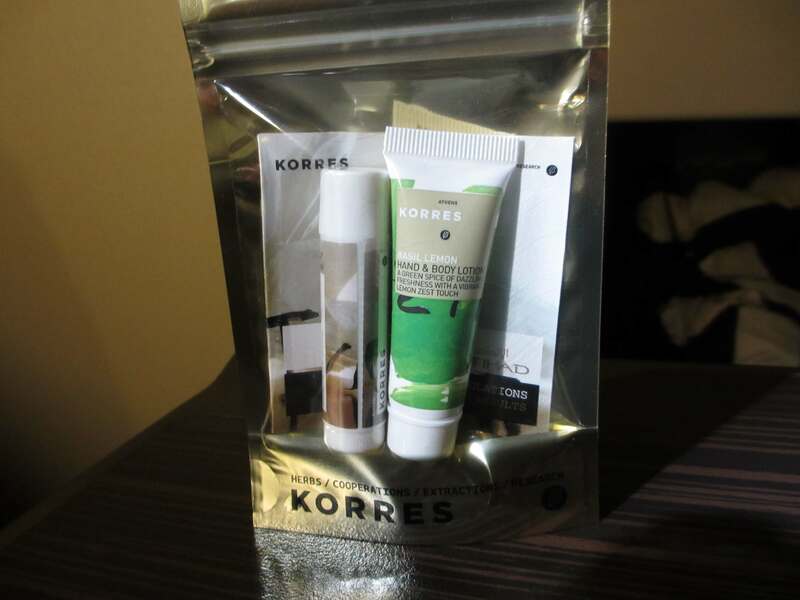 Amenity kits are now Korres, and while in a lighter, less substantial case are just as good. The Korres lime facial spray mist in the bathroom is fabulous, and I don’t miss an opportunity for a spritz when I visit. The bathrooms themselves are spotless at all time times. I’m in two minds. 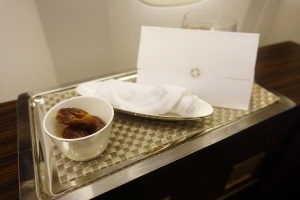 On many levels I think the Etihad Pearl Business Class is a much improved product. BUT. The service at the Transit Desk was woeful and that chocolate croissant could have been used as a paperweight. All in all, it’s a very good Business Class, but with just a little more consistent attention to detail it could be truly fabulous. You can search for and book an Etihad Airways flight via the link on the sidebar. 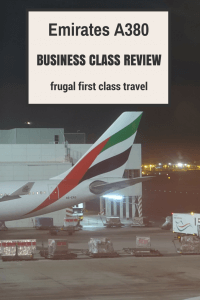 It’s an affiliate link, so you help pay for the operations of frugal first class travel if you choose to make a booking. 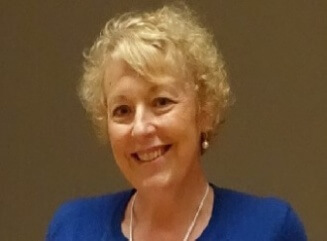 The author booked and paid for her own flights. On my AUH-CGK flight, I got upgraded to J class for free just for signing up for their mileage program…or at least that’s the PC way of looking at it. So, AUH is still a bit of a joke to transfer in? Seems that their J lounge had a bit of an upgrade if you’re mentioning using spas! The spa has been there a while – took me ages to work out it was free though! Thank you for your website by the way. Not often I read the author paid for their flights so hats off to you and it makes me want to return to read the next adventures. So… this spa at Abu Dhabi. I am a VA gold flyer (I know there are many of us in the world) so not that I’m special but it is nice to be acknowledged and actually receive a step change in service! I’ve had issues with the staff at AUH really not acknowledging this and mixed experiences on Etihad flights – some delightful, some where gold status meant perks which saw me return to fly Etihad again and last time nothing…I digress.. the spa at AUH – how does one find it and access it?! I am very interested in your check in experience. We had an identical experience flying from Manchester to Brisbane booked as a VA flight but flown Etiihad Pearl Business all the way. They couldn’t conect our flights in MCR and took 1.5 hours. We missed access to the lounge. Had to transit in AUH which was even worse and took even longer – they claimed our flight was overbboked. Checking in with Etihad overseas for a VA codeshare is a major issue. At the time, I was advised the problem was because I had booked my ticket before Virgin swapped over to their new ticketing system, and that once both airlines were on the same platform there wouldn’t be a problem. 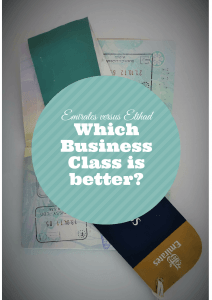 I like both Etihad and Virgin and am happy to fly them, however, I will be seeking written assurance, via my travel agent from the airlines, that I will NOT be required to get my boarding pass in Abu Dhabi for my onward Virgin leg. It’s just too much of a drama, and the service I was provided was dreadful. 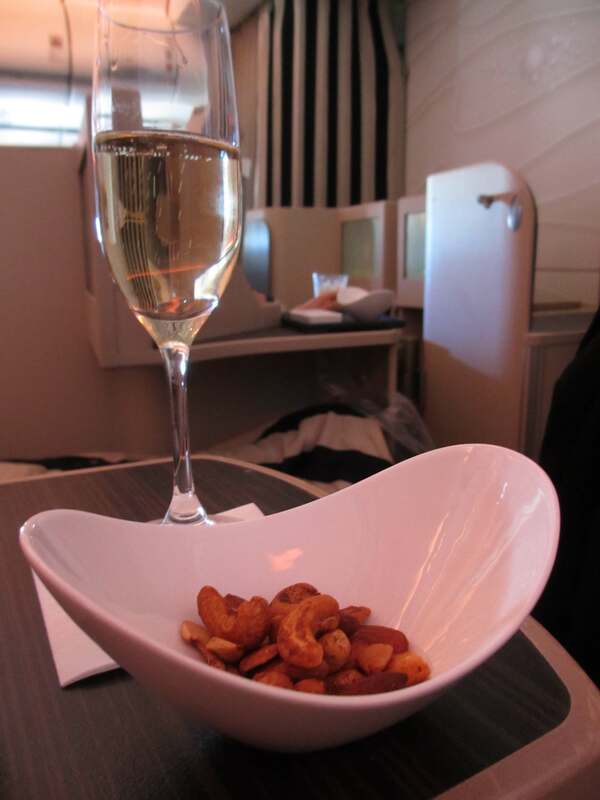 We’re flying Pearl Business Class tomorrow from Brisbane to Singapore – upgraded using their bid for upgrade system. I’m super excited as it’s my first time in anything but economy class. So looking forward to meals, comfort and space!! !